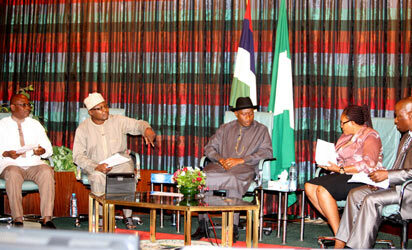 HAPPYNigeria noted the total neglect of health issues during the November 18 presidential media chat. We, and many other Nigerians, tweeted questions on health issues but none was read to the president. Is it not a paradox that in a country like ours with neck-breaking burden of disease and terribly weak health system, none of the journalists involved in the chat asked any question to President Goodluck Jonathan about what his government is doing to improve and strengthen the health system of the country? We find this very disappointing. It is a well-known fact that most of our leaders do not utilize the services of health facilities within the country because they can afford to travel to Germany, Britain and other countries with stronger health systems. Millions of Nigerians still die from preventable and curable health conditions. About 70% of total health expenditure is still out-of-pocket for a country with 56% of her youths without jobs. Over the last one week, international days for pneumonia, diabetes and prematurity were marked and Nigeria occupies unenviable positions in terms of burden and deaths from those conditions. World Toilet Day was just marked and UNICEF estimates that 34 million Nigerians defecate in the open and leading indirectly to deaths of about 500,000 children from diarrheal diseases and respiratory infections annually. Environmental pollution by frequent oil spills and gas flaring in Niger Delta regions has continued to worsen the health of many residents of the region. These and many more make it criminal for health to be ignored in any national discuss. Nigerians deserve a good quality health care that is made accessible and affordable to everyone irrespective of where they live and how much they earn. Life is a fundamental human right and only requires good health to be assured. It is very important that we as a people give it the importance it deserves because it is in everyone’s interest to do so. We hereby call on the Nigerian press, government at all levels and all citizens of the country to become more proactive than reactive when it comes to issues related to health. On our part, we will continue to educate and inspire young Nigerians to taking actions towards health development.